I visited the Royal Academy of the Arts exhibition 'Revolution: Russian Art 1917–1932' in London yesterday, just before it closes tomorrow. 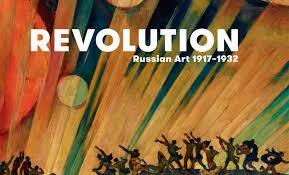 It is inspired by the exhibition shown in Russia in 1932, just before Stalin's clampdown on artistic free expression. 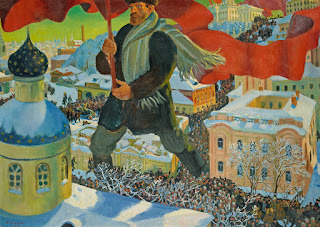 The exhibition covers paintings, films, sculpture, textiles and ceramics from the early days of the Russia revolution in 1917, and follows changes through the 1920s and into the 1930s under the influence of the Bolshevik leadership, particularly after the death of Lenin and the rise to power of Stalin. 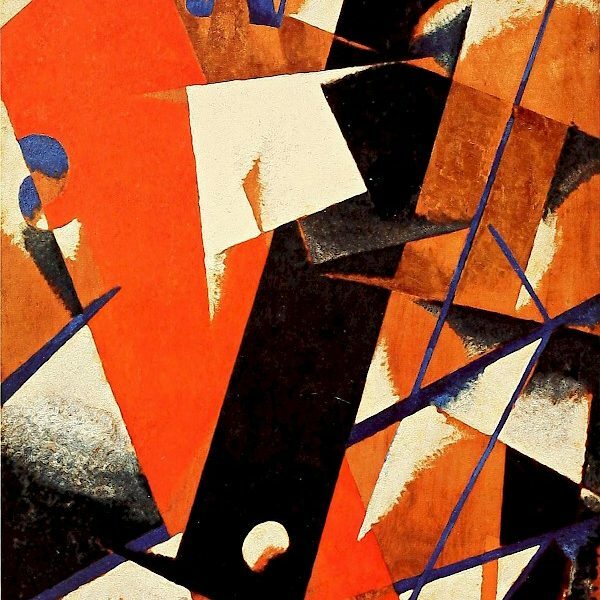 In the early years of the revolution there was a great explosion of the arts, which built on the trend towards the avant garde that had already begun in Russian (and more widely) before the revolution. 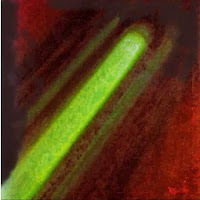 There was much excitement in artistic circles about the new dawn opening up in Russia, brought about by revolutionary thinking. Two examples are below. The Bolshevik's were only a fairly small force with something like 350,000 supporters in a country with a population of 140 million at the time of the revolution. 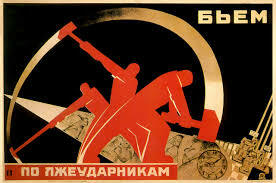 It was decided that propaganda was necessary to spread revolutionary thinking to the masses. 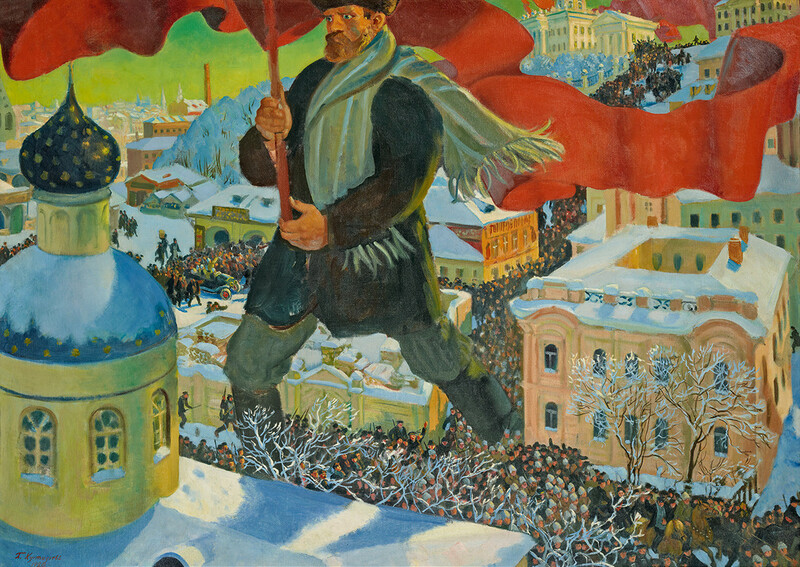 By the late 1920s the Soviet authorities condemned the avant garde style and promoted what became known as Socialist Realism, a style that was easy for the masses to understand. For a few years these different approaches co-existed, but in 1932 Stalin decreed that Socialist Realism was the only acceptable style for the Soviet Union, ending a era of dazzling creativity in the arts. 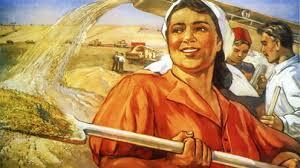 Stalin's principle goal was to turn the Soviet Union into a world power by expanding its industrial production. In 1928 he introduced the first of his five year plans, which set targets for each factory. 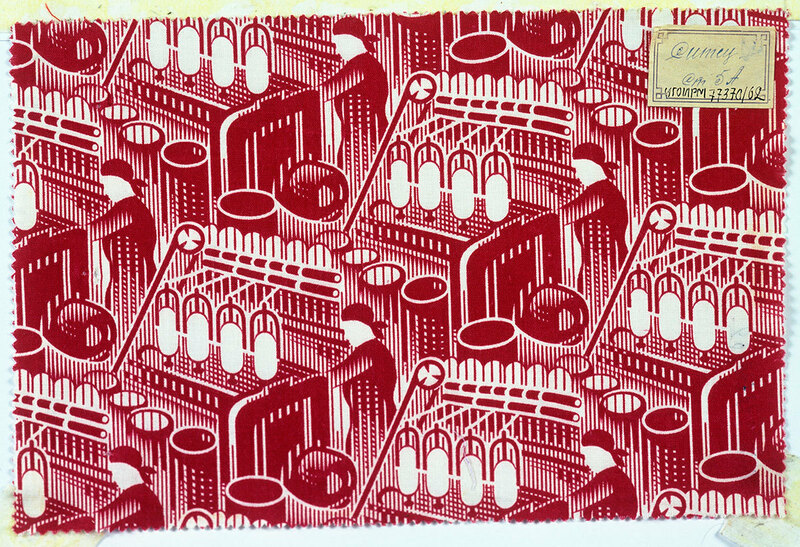 A new breed of superhero workers known as 'shock workers' symbolised this synthesis of man and machine. Artists were encouraged to depict this in their work. 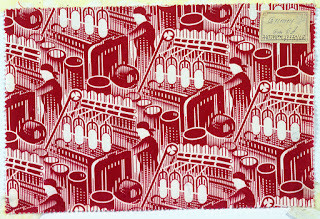 Workers were seen as the liberated proletariat who no longer had to sell their life and labour for the profit of others. Together they collectively owned the means of production interpreting what Marx called the 'dictatorship of the proletariat,' in this new worker led productivist system. This conveniently ignored Marx's concept of 'freely associated' producers, in favour of what Lenin first called 'state capitalism,' which was ruthlessly and brutally driven forward by Stalin. The reality was that many workers were effectively slaves, and strikers and slow workers were imprsioned or even shot. Thousands died in accidents, of starvation or from freezing temperatures. 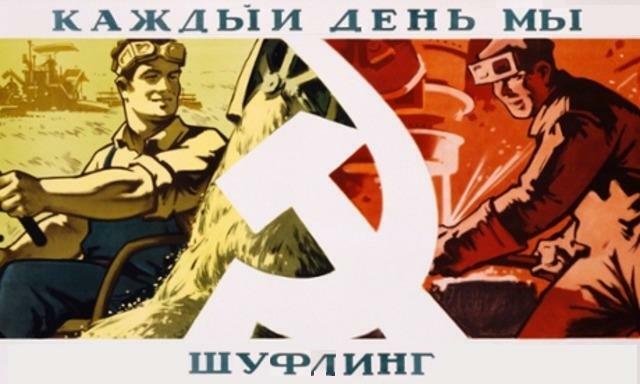 After the revolution, the peasants were promoted as equal partners with industrial workers, symbolised by the by Soviet emblem the hammer and sickle. Stalin's plan involved the industrialisation of agriculture which included the collectivisation of farms into large operations, but took little notice of local conditions and practises. Famine was the result where millions died of starvation, through crop failures. 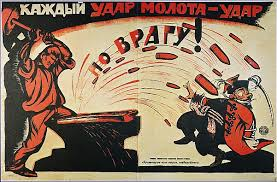 Stalin also promoted sports in Russia, with the competition with the US in events such as the Olmypics eventually. By the 1970s it was seen as a demonstration of the strength of the Soviet system over the capitalist USA. In the same way, Russia beat the US into putting a man into space, only 40 years after the revolution, which had started from a low point of a virtual feudal economy. The 1932 exhibition was the last call of freedom for the arts, afterwards avant garde art was suppressed. Within a year it had vanished from public view, locked in storerooms. From this moment onwards the Union of Soviet Artists was the sole arbiter of Soviet art. 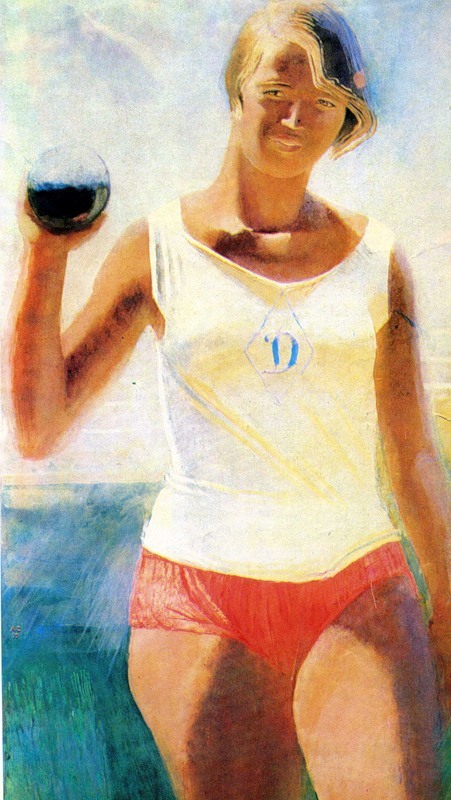 Socialist Realism became the only approved style in the USSR. I knew from political history much of what this exhibition portrays, but it was still interesting to view it through the prism of art. The euphoria and promise of the early years of the revolution, with its upsurge in creative arts, gradually ground down into simplistic propaganda, in the cause of authoritarianism and suppression. A vivid dream turned into a nightmare. The exhibition details neatly the bastardisation of socialism in the USSR, and left me feeling sad, an opportunity missed. The above puts me in mind of my art college degree thesis (1975) called 'Triptych of the Thirties'. 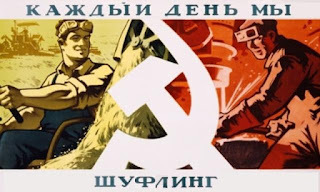 It gathered together the socialist realism strands of Russia, Nazi Germany and the USA and represented a lot of research work - showing that the Zeitgeist transcended the left/right ideologies. I can see now why my sly tutor wanted to 'borrow' it for a book idea of his own. My then boyfriend urged me to keep it to myself. He may have been right to protect my copyright, but sadly I never wrote my own book either! Who’s ready for a snap election – and who isn’t?